Wildlife-vehicle collisions cause over 200 human fatalities and 29,000 human injuries, and cause over a billion dollars in property damage, in America each year. 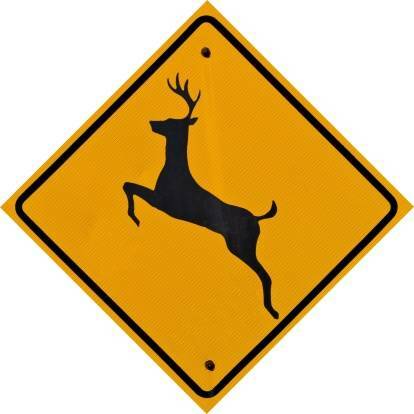 This is just one type of animal related car accident motorists have to worry about in California. You must also be on the lookout for runaway pets and roaming livestock in certain areas. Important legal questions arise in relation to animal-vehicle crashes, including who is liable, who pays, and what should be done in accordance with the law. The Ellis Injury Law Firm can help clear up the confusion if you were injured or lost property in a recent animal related car accident. Who pays for damage from animal related car accidents? Collisions with wildlife: Comprehensive car insurance coverage typically applies to animal-vehicle collisions. By law, you must purchase the minimum requirements for bodily injury liability ($15,000/person, $30,000/accident) and property damage liability ($5,000). Your bodily injury coverage will pay for any physical injuries sustained by you or your passenger. Comprehensive coverage is an additional purchase that includes property damage caused by animals. In the state of California, the cost to add comprehensive and collision coverages to your policy will be about $981 a year, according to 2017 statistics. With the average repair costs of animal-related accidents easily reaching $3,000 – $10,000, it’s a price worth paying for many California vehicle owners. If you do not have comprehensive coverage, you have to pay for the damage yourself. To file a claim with your insurer, the cost of the damage must exceed your deductible (which can be as low as $500 or as high as several thousand). Collisions with pets or livestock: In accidents involving pet or livestock owners, the state usually finds the owners liable for failing to adequately leash, enclose, or otherwise restrain their animals. The pet or livestock owner is either personally liable to pay for your injuries and damages or, in some cases, you may access their homeowner’s insurance coverage. If the owner cannot be located, your personal injury and comprehensive car insurance coverage should pay for the damage caused. What should you do after an animal related car accident? Get help. You must call the police to file a report. If you hit a domestic animal and fail to call the police, you could be charged with “failing to render aid” and “leaving the scene of an accident.” A police report will also come in handy when dealing with insurance companies. Be sure you get the contact information for eyewitnesses and animal owners involved in the accident. Take photos of the scene, any injuries, and the damage to your vehicle. Stay safe. It is common sense to get yourself and your vehicle onto the shoulder of the road to avoid being struck by oncoming traffic. Do not try to move the animal until help arrives. Hurt animals may lash out in attack mode. If you must move the animal because it is still laying in the path of cars, it’s best to avoid direct contact by wrapping the animal in a jacket or blanket and using gloves if possible. Keep in mind there may be legal ramifications for moving an animal. Once you “take possession” of the animal, you can become financially responsible for ensuring it receives appropriate medical care. File a report. If the animal died, file a roadkill report with the California Roadkill Observation System, which will help the state track animal-vehicle collisions and make necessary traffic flow improvements. Know your rights when dealing with insurers. Do not give any recorded or written statements to your insurer until you understand your coverage. Seek legal advice before signing a release or waivers offered by your insurer. You do not have to automatically accept the estimate or appraisal of your losses offered by the insurance company, nor do you have to get the repairs done where they prefer. Most policies put you on a time constraint to provide proof of loss and settle the claim (typically within a year). When might you need a California personal injury lawyer? A Los Angeles car accident attorney from the Ellis Law Firm would be an asset to your situation if there is any question regarding your legal rights and who pays. Serious animal related car accidents involving injuries, death, or extensive damage are best handled by an experienced personal injury attorney. Southern California residents are invited to contact us to have their claims reviewed free of charge.